Just add water for instant Blob! The little Mr. Wizard in me loved to experiment with water in science class. It was amazing to me that it could be a liquid, a gas and a solid. But now in 2005, water can congeal, forming a jelly-like matter with the addition of 8 ounces of a product called Jellybath. Why congeal water you say? Because in a bath tub that you could soak in, it forms an insulating barrier to hold the heat of the water in longer. And that is way cool. The powder additive contains non-toxic elements to turn the water to jelly as it is absorbed into sodium polyacrylate. Additives that are good for your skin like vitamin C as well as black tea extract, L-menthol, coloring, and fragrance are also mixed within the powder. The inventor from Kobe Japan filed the patent in February of 2000 (probably after taking a bath that quickly became cold) which was granted relatively quickly in August 2001. The patent #6,281,177 reads like a recipe until you get to the scary claim fifteen, a subordinate of number nine. It reads "gelatinous mixture draws water from human skin immersed in said gelatinous mixture." I may be reading into this, but wasn't something JUST like this a source of a horrifically scary movie from the late 1950's? That's right. 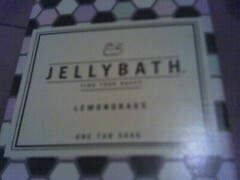 Jellybath is The Blob.